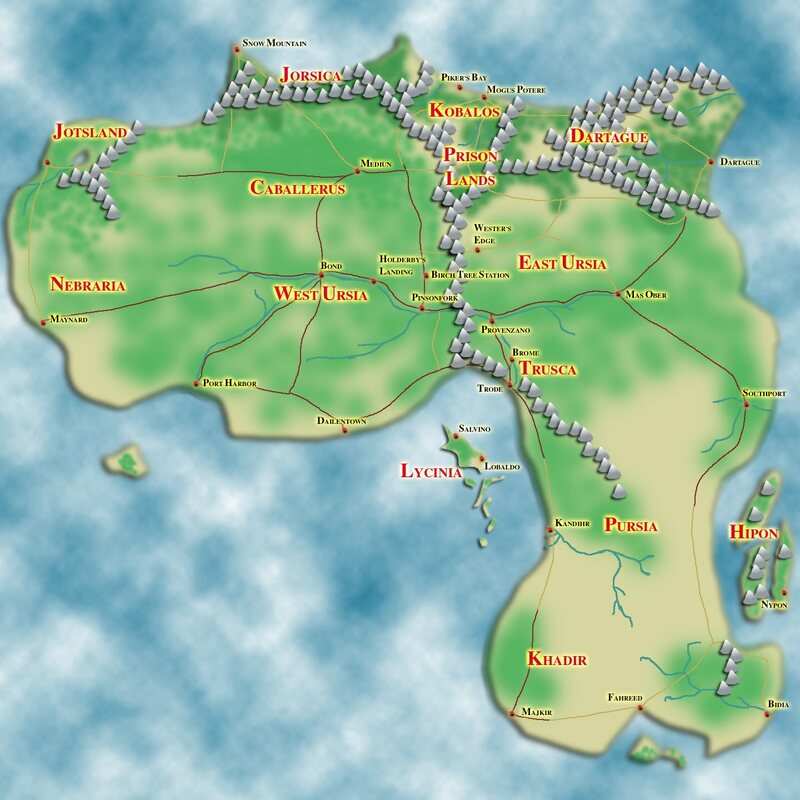 What are The Ursian Chronicles? 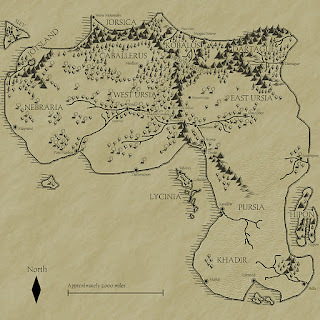 It is my ongoing epic fantasy series of novels and trilogies that take place in the world of Ursia. Probably my best-known character in the series is Kron Darkbow, though Kron does not appear in every single novel of the overall series, which takes place in and across a long expanse of time, roughly ten thousand years. How many novels will it take to complete the series? I don't know. My guess would be about 40, but that's only if I don't come up with even more ideas I feel are worth writing about, and if I can live long enough to finish the entire series. Please keep in mind that while I believe this is the best order in which to read these novels, that does not necessarily mean that is the order of events in the overall timeline. 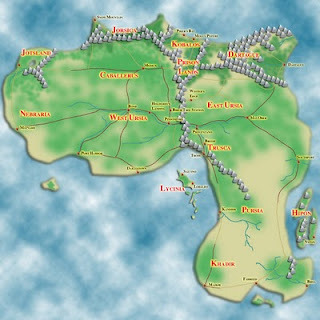 In fact, the events of The Kobalos Trilogy occur nearly two thousand years after the events of The Sword of Bayne trilogy. Each novel and trilogy will have some relation to the others in the larger series, though that relationship might not be readily evident, at least not until later readings when further novels in the series are available. And don't worry. More novels and trilogies will be coming in the future, as soon as I finish writing them and have them edited. What's the next novel to be titled? That's another good question. Right now it is tentatively titled The Company of Seven. It will feature my Kron Darkbow character and takes place fairly soon after the end of The Kobalos Trilogy and the novel Demon Chains. It is not impossible I would begin work on another, related prequel trilogy about the history of my Belgad character. 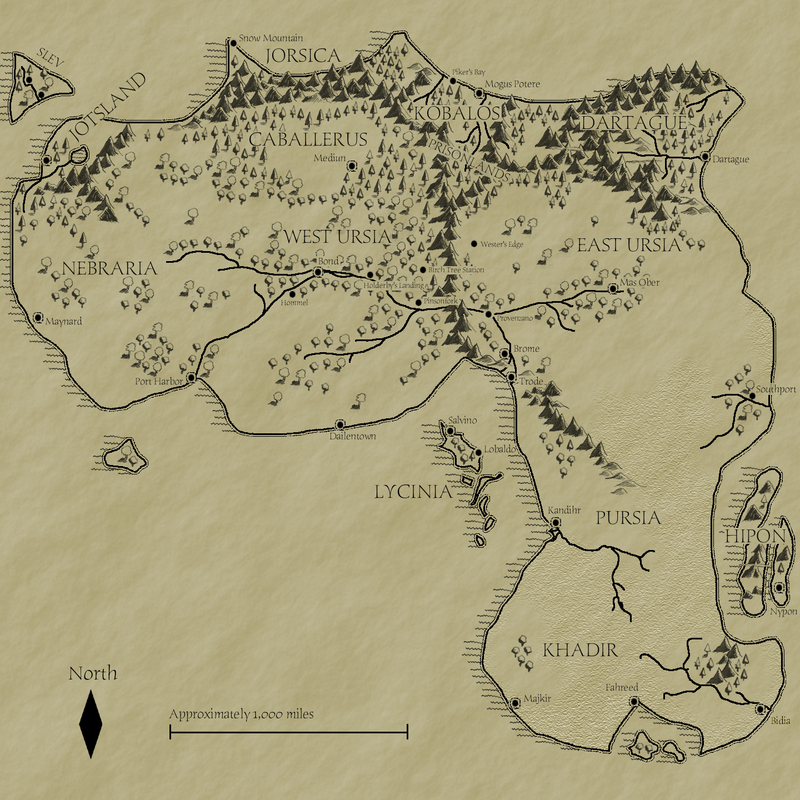 Below are two different maps of the continent of Ursia.